The 2004 SARRAH National Conference was hosted by Lassiter’s Convention Centre in Alice Springs from 26-28 August 2004. The Conference represented a strengthening and maturing of rural and remote Allied Health Professionals (AHPs) as a group. SARRAH has come a long way in the past 10 years and this event demonstrated the ability of AHPs to negotiate at all levels of Government as well as maintain our responsiveness to consumer and community needs. Alice Springs, Mbantua, with over 40 000 years of history, lies literally in the heart of Australia. August is a time when the country is at its best with warm sunny days and cool clear starry nights. Depending on the amount of rain over the past months, it can also be a time for wildflowers. It is the ideal time for camping, hiking the Larapinta Trail or just sightseeing among the magnificent Western MacDonnell ranges. Used by people from various communities, walking together – side by side describes how to work together. By walking together we can have differing roles, differing levels of expertise, yet we each have a valuable contribution to make. This conference showcased many initiatives in health service delivery where consumers, service providers, planners and funders have walked together. The conference challenged all participants to reflect on and explore the nature of working with rural and remote communities. Produce recommendations based on the Conference themes. Members of the rural and remote allied health and oral health workforce and managers of these services; allied health students preparing for a future rural health career; workforce planners, developers and funders of health policy and programs relating to rural and remote allied health services, educators of allied health professionals and consumers of these services who were interested in the dynamic developments in allied health services. 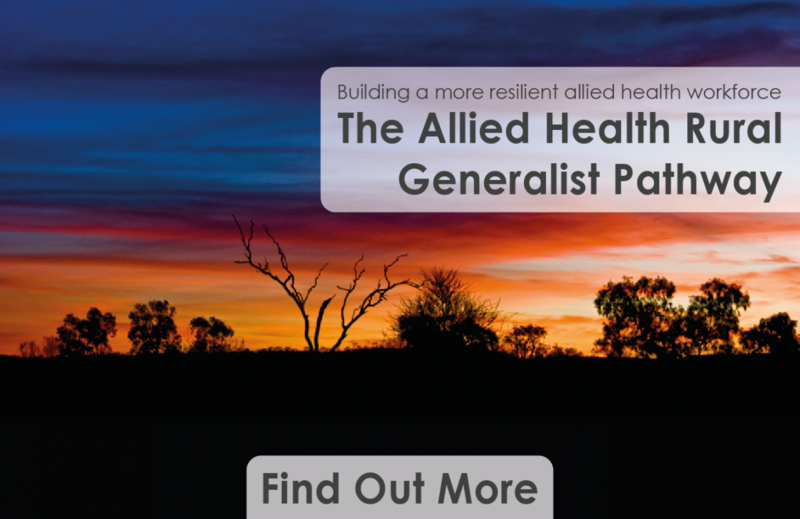 The allied health and oral health workforce includes, but is not limited to: Aboriginal Health Workers, Audiology; Dentistry, Dental Therapists and Hygienists, Nutrition & Dietetics; Medical Radiation Science (Medical Imaging, Therapeutic Radiography, Nuclear Medicine); Occupational Therapy; Optometry; Orthoptics; Orthotics and Prosthetics; Pharmacy; Physiotherapy; Podiatry; Psychology; Social Work, Speech Pathology and Allied Health Assistants.